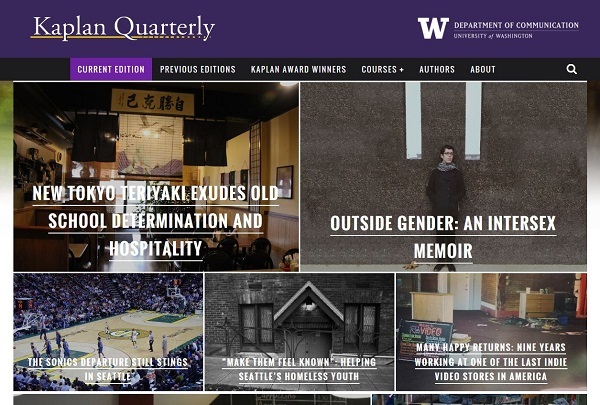 Every year, the UW Department of Communication gives several outstanding students a Kaplan Award for their excellence in narrative writing in the categories of: people on the margins, strong writing style, a human personality profile, a strong epiphany, and an important public issue. This award is presented in honor of Deborah Kaplan, who was known for her immersion journalism, relentless investigative reporting, and in-depth interviewing. After joining the faculty of the UW Department of Communication in 2003, Kaplan experienced an apparent heart attack, which led to her unexpected death in 2006 at age 53.